↑ Watson, Frank D.; James E. Eckenwalder. 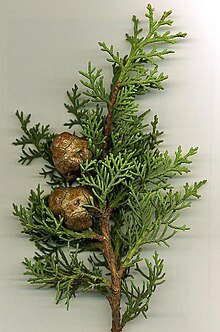 "Cupressaceae Bartlett: Redwood or Cypress Family". eFloras. Missouri Botanical Garden. अभिगमन तिथि 6 September 2013. ↑ Little, D. P., Schwarzbach, A. E., Adams, R. P. & Hsieh, Chang-Fu. (2004). The circumscription and phylogenetic relationships of Callitropsis and the newly described genus Xanthocyparis (Cupressaceae). American Journal of Botany 91 (11): 1872–1881.